I really like this new purse design. Simple, nice shape, hangs well, something about it feels right. This is the prototype. 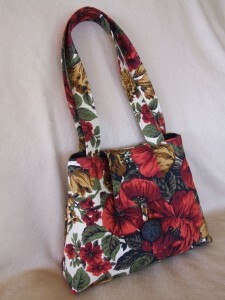 I made it before the Pink Hibiscus Purse. It is an example of using a fabric I had wanted to purge from my overwhelming stash. Not because I don’t like it. I find myself having to ask “Is it your very favorite?”. I have so much fabric I love, I need to pass on some of my not-very-favorites, so fabric piles don’t take over my dining room, thus qualifying me for an episode of Hoarders. Regardless, my other voice said “Can’t you just make something out of it?”. So I did and now I just love the fabric. I know, I am hopeless. I do like the purse, though. Love the fabric & your new design!! I know I’m only encouraging the hoarding, but I love it!